Indeed, 1977 was a long time ago. Tim Couch was born that year. Jimmy Carter was inaugurated President. Elvis, at least for part of the year, was still alive. Tom Landry was roaming the Dallas Cowboys’ sideline, and Terry Bradshaw was throwing passes in Pittsburgh. “Laverne & Shirley” ruled television, and Star Wars debuted on the big screen. And the Kentucky Wildcats were really, really good at football, going 10-1. Despite the fact Florida wasn’t even very good in some of the recent seasons, Kentucky’s 31-year losing streak to the Gators consumed the attention of the Big Blue Nation. After a series of difficult defeats to Florida, Kentucky finally broke through in 2018. They beat a team that they hadn’t taken down since 1986 … and in fact, beat them in Gainesville, a place they hadn’t won since 1979. Kentucky trailed at the half, took the lead in the third quarter, and then found themselves fighting off history and holding on for dear life on one big — if confusing — final defensive stand. The Streak was dead, and Kentucky’s 10-win season really began gathering momentum that night. Kentucky has produced some standout defenders over the years. Usually, the Wildcats have to nab somebody who is a little undersized or playing out of their natural position … but in 2018, Kentucky had the biggest defensive monster in college football. Four short years ago, Josh Allen was a skinny 2-star prospect from New Jersey. In 2018, he was absolute death to opposing quarterbacks. Allen led UK in tackles, led the SEC in sacks and tackles for loss, and was absolutely unblockable. He leaves UK not only as Kentucky’s first consensus All-American in several years, but as the absolute unstoppable force of the 2018 season. Forget the records and the accolades, just seeing the best defender in college football in blue and white was unforgettable. 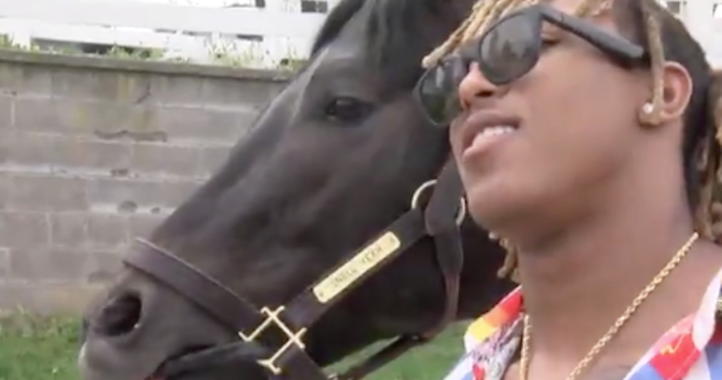 Similarly, 3 years ago, Benny Snell was forgotten by Ohio State, overlooked by Penn State once Bill O’Brien left town, and found his way to Lexington, where he was expected to back up starting running back Boom Williams. Three 1,000-yard seasons and a million broken tackles later, Snell left UK as the school’s leading rusher, scorer, and possibly motivator. On a team that reveled in being underrated, Snell became the mouthpiece, the guy who effectively told the world, “You tried to forget me, but good luck trying to tackle me in the fourth quarter.” Snell rushed for 3,873 yards and 48 touchdowns in three seasons. He also helped UK win 24 games in those seasons. Despite a 9-3 regular season, Kentucky found itself nearly a touchdown underdog against Penn State in the Citrus Bowl. In many ways, it was a mirror for Kentucky’s season, with the Wildcats again finding themselves considered as the have-nots in a battle with a traditional NCAA powerhouse. Kentucky raced to a 27-7 advantage before holding on late for the 10th win of the season. 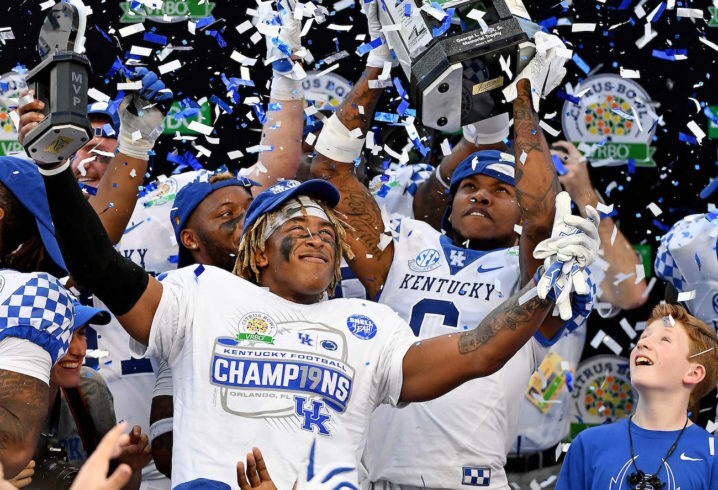 Snell became the school’s all-time leading rusher, Allen had 3 more sacks and a blocked field goal, and Kentucky cemented its status as the school’s best team in recent memory with an impressive victory. 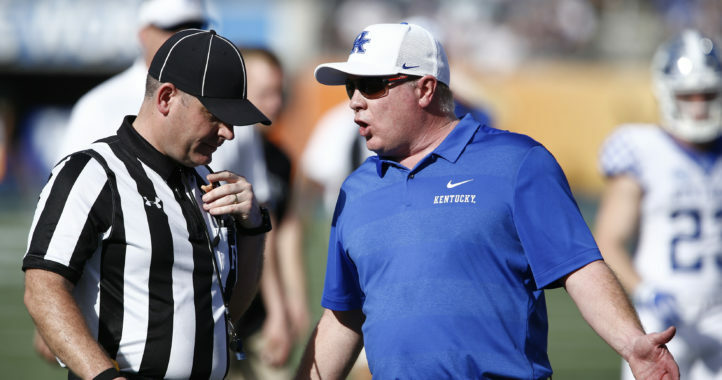 Other than not winning all that many games, Kentucky football’s historical calling card has tended to be painful last-second losses. Hail Mary against LSU? Check. Seven overtime loss to Arkansas? Yep. Leaving receivers uncovered against Florida? Been there. So when Kentucky pulled off a 15-14 untimed down win at Missouri, it was more than another last-second win. For the team that had historically had no luck except bad luck, it seemed like Kentucky had turned over a new leaf. QB Terry Wilson’s 2-yard dart to C.J. Conrad exorcised a few of the demons still left after the Florida game, and provided Kentucky fans with another memorable moment from 2018. Gotta say it was cool to watch UK have such a good year (aside from Week 4). Hopefully they can keep it up next year. Gonna be tough without Snell or Allen though. Unbelievable fun season for Kentucky fans. Twas a very nice season for Kentucky. I’m doubtful they can maintain that though. Of course they will go at least 10-3 from now on. The most fantastic football season in all of college football! Not just in Lexington. Well, Tennessee may have something to say about that. OH, are you the one who called me a Tennessee fan earlier this season? It was a good season for the Cats. The Florida win was something that was eventually going to happen. A coach, in his first season playing with someone else’s recruits. The team being coached by men who didn’t coach them the previous year and trying to install a different system. (ditto for Mississippi State) Still a great win. The A&M game introduced us to big time football. The offense didn’t get past midfield until they set the ball down on the 25 for the overtime. Shut Snell down big time. Maybe the Tennessee game was an abnormality. But seeing how they beat us almost annually how do you OVERLOOK them? Kentucky shouldn’t over look anybody. Ten wins looks good. Let’s leave it at that. (or I could bring up they played the 13th weakest schedule in the SEC). Although they are still consensus top 30 SoS nationally and in several top 15’s. Good try trolling though. Seems you and many others have problems with ‘facts’. And who’s trolling who? If you want a pep rally comment on someone else’s post. Well Paris the article was written to celebrate. They wrote one for almost every team. You are the one that wants to be a wet blanket. Go back to Card Chronicle. I believe the reason people call you a troll is not because of your facts (although they are usually just opinions or what ifs), but because you have nothing positive ever. You are the SDS poster child for keyboard warrior. I know your secret. He’ll, even you put facts in quotes. Bourbon Blue, I reviewed your comments and the major of them are commenting on me. Dispute any ‘fact’ I post. And I certainly want you to tell my secret. You seem to post similar comments to SevenT. I can’t believe this site would let two of that intelligence on here. Could that be you? I think any positive comment on here, considering it was only 41 years to get any one of any merit, I guess we should be happier than a pig in slop. You’re a Louisville fan and a Kentucky troll. Everyone here already knows that. Your team was terrible so you are trying to rain on Kentucky’s parade. Sad and pathetic, just like your team. I must have missed this one before. I guess I was simply looking for comments on the subject of football. But you seem to enjoy trolling me and using words you can’t prove. That’s about the level of your education. Third grade? But hey, when you are limited to lying to get attention, what should one expect? I’ll look for your posts today and drop by. See ya. They are coming out of the woodwork now. A Louisville fan! I must have posted sometime Lamar Jackson was a pretty good quarterback so that makes me a UL fan. I’m a Bama fan too because I posted Damien Harris was better than Passionate Benny. But its wonder to have people that care so much about my vomments. Oh, I live in Florida so does that make me a Florida fan too? And you’re quite the liar. You have said that you are mainly a Louisville fan, but also pull for Kentucky. Your comments prove yourself to be a liar, and just a bitter old dude. Unlike you, I have all my faculties and remember what was said. You should take your delusion elsewhere, but we all know you love the attention, no matter how negative. Show me ANY post where I said I was a Louusville fan. ANY WHERE,ANYTIME. Go for it. Wants mention my bathroom habits? I want to ask forgiveness for not responding to you slanderous remarks with the same. LSUSMC have you found the post ANYWHERE were I said I was a Louisville fan? But hey, maybe the pot and other drugs has fogged you mind. I guess I could call you a ‘liar’ but you’ve used that on me. Time to play big boy and show us where I said I was a Louisville fan. Until then, keep trying to show up you aren’t still in a ‘fog’. You’re the one who is quite the liar it seems. Can’t back up your statement. Seems you and yout running mate Seven use slanderous remarks when you can’t handle facts. But, hey, name calling is third grade responses good to see you got that far. I thought you didn’t care about my age or medical condition. But you’ve already proved that. Never mind old Paris. He is a broke bitter old man with dementia. The world has passed him by. His claim to fame is he says he was a correctional officer of the court. What kind of sick low life would choose such a pathetic job? Shouldn’t you be using your comments about my wife now? I imagine you have had a probation office a few times in your life. Maybe you, like LSUSMC, have toted a little too much. You know that will violate your probation so be careful. At least I retired from my position and not living in momma’s basement like you are. Just to reiterate the final stats for the self proclaimed greatest running back in college football for 2018. Second in the nation in carries. Sixth in the country in the SEC in average yard per carry. And Thirty sixth in the country in the same stat. Some of the geniuses on here thing the average yard per carry isn’t important as how many times you carry the ball. So I’ll break it down to basketball terms for them. When there is a technical foul who do you send to the line to shoot the shots? The guy who has shot the most foul shots for the team, OR the one who has the highest free throw percentage? What do you thing pot head? Or you may want to confer with the exposed liar, LSUABC.